Game development studio, established on January 1, 2002. The driving force behind Sega's NCAA games, Kush is based in Camarillo in southern California. Poised to defend its title as the #1 rated hockey videogame, ESPN NHL Hockey returns to the ice with the confidence of a seasoned veteran. Improved player control, an all-new fighting engine and lightning fast gameplay truly capture the feel and pace..
ESPN NHL Hockey emerges with new levels of realism and detail, not yet seen before in hockey video games. Experience the complete NHL environment from the real-time reflections of the arenas on ice to the lifelike appearances of the NHL pros - no det..
Major League Baseball 2K5 World Series Edition features an all-new Pennant Fever and World Series modes, updated '05 All-Star teams and rosters and exclusive MLB merchandise including a custom DVD!.. Passion, dedication and purity - these are the foundations of NCAA basketball. SEGA Sports, maker of the acclaimed "NBA 2K" series, hits the college hardwood this winter with "NCAA College Basketball 2K3." From tip-off at Midnight Madness to the net .. The champion of video game hockey is back! NHL 2K6 continues its legacy as the #1 rated and now #1 selling NHL game with more control, more emotion and more detail than ever before. Take command of tape-to-tape passing, behind-the-net plays and preci.. 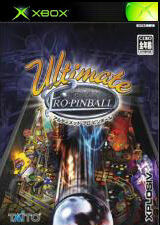 Ultimate Pro Pinball is a compilation of the last three Pro Pinball titles released, Timeshock, Big Race USA & Fantastic Journey. The tables have been ported exactly how they were in the PC versions. ..